Carters Yard, CNM’s latest scheme with its client Peabody, was completed in December 2015. The 41 residential unit scheme is part of the regeneration of Wandsworth in south London. For more infomation on the scheme please click here. Fashion brand, H&M are upsizing their current 25,000ft2 outlet at Bluewater to create a new 40,000ft2 statement store. This complex and challenging project will see H&M continuing to trade out of their current lower trading floor whilst a new and extended upper floor and mezzanine is constructed within the existing MSU and above the busiest service yard at the Centre. Full planning permission was obtained in December 2015 with major enabling services diversion works started immediately thereafter in advance of piling which has just commenced. The shell and core works are programmed to be complete by August 2016 for handover to H&M who aim to trade out of their new MSU for November 2016. CNM are providing full structural engineering, below-ground drainage and retail delivery compliance monitoring duties for the Client, Land Securities and this follows CNM’s ongoing and successful previous involvement at the centre including the extended 30,00ft2 statement store for Topshop/Topman and the upsizing of Next to a new 44,000ft2 MSU. Clarke Nicholls Marcel is celebrating 70 years of engineering in 2016. The company will be hosting a number of celebratory events throughout the year, but in the meantime, please click here to read a little bit about our history and see some photographs from our archives. 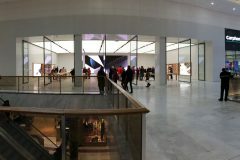 A striking new flagship 13,000ft2 Apple concept store has opened at Brent Cross Shopping Centre. CNM’s proud and successful association with the Centre dates back to the early 1990’s and the Apple project involved the major demolition (including the removal of 6 internal columns on the Upper Mall) and reconfiguration/amalgamation of existing units to accommodate a new column-free unit. The new Apple Unit also formed part of the major remodelling and extension of the existing West Court atrium which was itself increased in area from 3,300ft2 to 6,000ft2. CNM successfully provided full structural engineering services for the Client, Hammerson up to Employer Requirement Stage at which point we were then appointed by the D&B Contractor, ISG to take the project to practical completion. The 65‐week construction programme was successfully completed in November 2014 and Apple finally opened their iconic unit in November 2015. 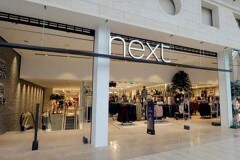 After 10 months of phased refurbishment, Next has unveiled its upsized and revamped store at Bluewater. CNM provided structural engineering compliance monitoring advice for the extended 44,000ft2 MSU on behalf of Land Securities and in conjunction with Bluewater’s retail design and delivery team. This follows CNM’s ongoing and successful previous involvement at the centre including commissions for leading concept stores and signature brands such as American Eagle Outfitters, Victoria Secret, Adidas, Topshop Topman and Rockar Hyundai. 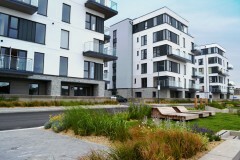 Millbay’s latest phase of development, Quadrant Quay, won Best Residential Development at the South West Insider Property Awards held in Bristol. For more infomation on the whole development please click here. 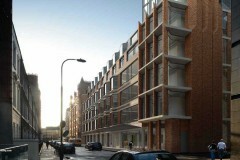 CNM have recently issued the RIBA Stage 3 report for the new University College London Hospital Phase 5 building project. The proposed facility will have a total GIA of 10,500m², accommodate the RNTNE, EDH and other Head and Neck services, and will serve approximately 1000 adult and paediatric outpatients a week. 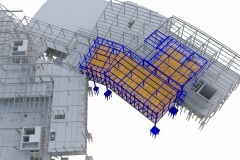 The project is being designed to BIM Level 2 in line with the current UK Government requirements for public sector projects. Conditional planning approval was granted by Camden in June 2015 and the new construction works will start on site in mid-2016. 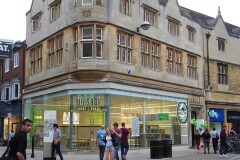 Wasabi Cambridge opened its doors to hungry customers on 18th June 2015. The largest of its type with 100 covers, Wasabi Cambridge is located in a sensitive conservation area within the heart of the city. 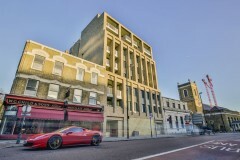 CNM worked successfully with Haskoll Architects on the major structural alteration and reconfiguration of the 4-storey 4,200ft2 building originally built in 1939. Work is complete on this extensive refurbishment and fitout of this two storey 50,000 sq ft office space for commercial property advisor GVA in the heart of the City. 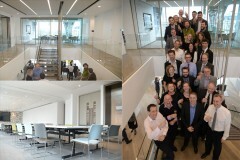 CNM representatives Mark Daly and Roy Colim attend the formal unveiling of British Land’s 45,000ft2 office refurbishment at their Marble Arch London HQ, York House. Having originally designed the structure in 2004, CNM were reappointed in 2014 to provide structural engineering services with the main focal point being the formation of a dramatic new atrium stairwell linking third to fifth floors. 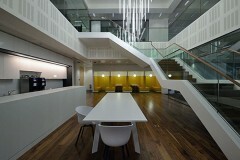 The project has also achieved a BREEAM ‘Excellent’ rating. Copyright © 2019 Clarke Nicholls Marcel.